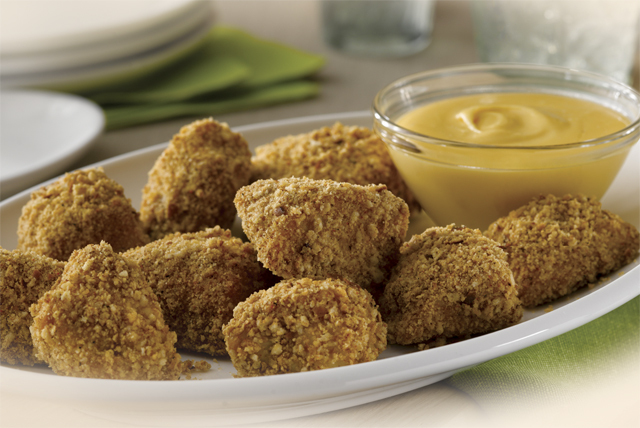 The flavor and crunch you love about pretzels coats juicy pieces of chicken breast. Perfect for dipping in the VELVEETA-GREY POUPON Sauce. Coat chicken with coating mix and bake as directed on package. Microwave remaining ingredients in microwaveable bowl on HIGH 1 to 1-1/2 min. or until VELVEETA is completely melted and sauce is well blended, stirring after 1 min. Prepare as directed, cutting chicken breasts into 1-1/2-inch-wide strips instead of the chunks.